This is where it gets a little bit tricky perhaps. 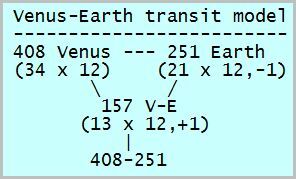 The proposal is that there are overlapping Venus-Earth planetary cycles of 251 years (157 synods), each starting and finishing with a pair of Venus transits, such that the finishing transit pair of one cycle is also the starting transit pair of the next cycle, each ~8 year period corresponding to 5 Venus-Earth synodic conjunctions – often referred to as the Venus-Earth pentagram. So where we have 8-235-8, each ‘8’ would start and end with a Venus transit (except when Venus passed too low or too high to appear in front of the Sun). Now let’s look at an edited copy of the ‘2001 CE to 4000 CE’ part of that data. All the red highlights each link together the two lines of data where the transits are 251 years apart. Ignoring the Transit Series numbers, note that for every pair highlighted the GST(h) column figures are close to an exact match (e.g. 2004 = 17.137, 2255 = 17.141 and 3705 = 18.182, 3956 = 18.184). ‘Sun RA’ and ‘Sun Dec’ for each 251-year pair are also very close. Example: a difference of 0.002 hours = 7.2 seconds (as between 3705 and 3956). The point is that this close matching is LESS true for all the 243-year pairs (the ones with matching Transit Series numbers). That seems to mean the 157-synod period of 251 years must be closer to an exact cycle than the 152-synod period of 243 years. Note: 13, 21 and 34 are Fibonacci numbers. 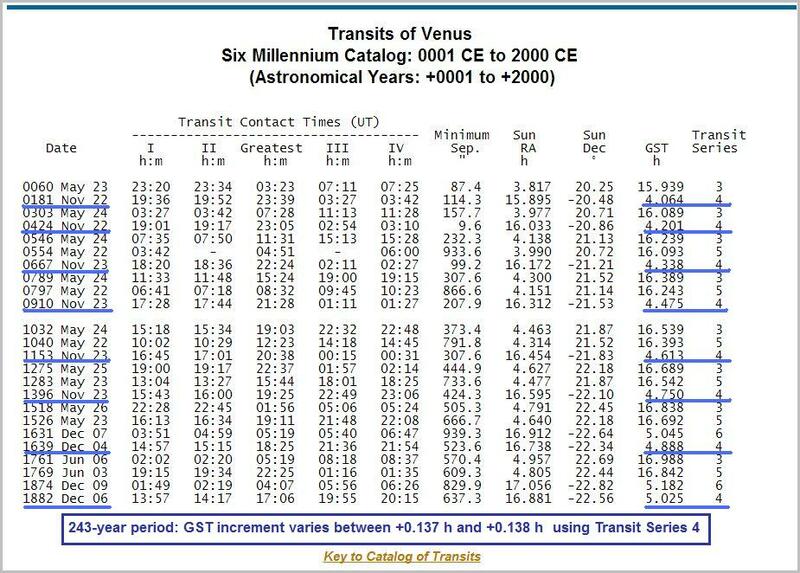 NB: in the Transits of Venus graphic shown above, after the ‘gap line’, there are ‘missing’ transits because in that era there will be several times when Venus does not pass in front of the Sun (transit) as viewed from Earth on the expected date (too low or too high). So in this model one year is ‘lost’ every 251 years, causing the ‘-1’ figure to appear. This lost year is an accumulation of the 2.32+/- days not taken up in each so-called 8-year cycle of each group of 5 Venus-Earth synods that produce the pentagram. Recap: each 251-year cycle in this model starts 8 years or 5 Venus-Earth synods before the previous cycle ends, i.e. there’s an overlap as shown in the ‘8-235-8’ graphic above. 2004-2255 is followed by 2247-2498, while 2117-2368 is followed by 2360-2611. Footnote: there may be implications for planetary theory e.g. precession buried in this, but for now we’ll try to accept the published numbers. Those who look closely enough may see one or two potential inconsistencies. NASA’s own planetary data is here. A fascinating read which points to an underlying symmetry in the planetary cycles. There is one important little detail that is missing from your analysis. You are using the years of the actual (i.e. 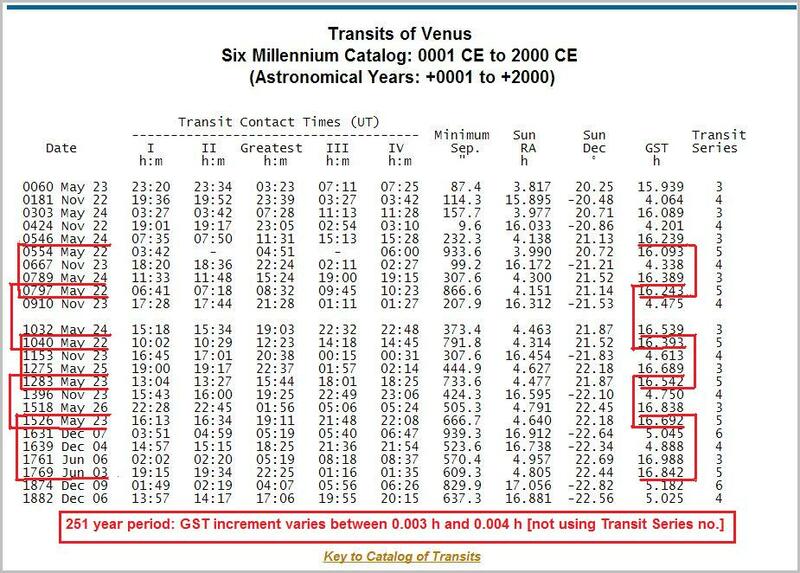 observed) transits of Venus across the Sun. The years in which the observed transits take place depends upon the relative positions of Venus, the Earth and the Sun (i.e. it is matter of the perspective of Venus and the Sun, when seen from the Earth). What you should be looking at is the position where the orbit of Venus crosses the Earth-Sun plane (i.e. the ascending or descending node of Venus’ orbit) as this a more fundamental feature of the underlying orbital mechanics that causes the transit phenomenon. 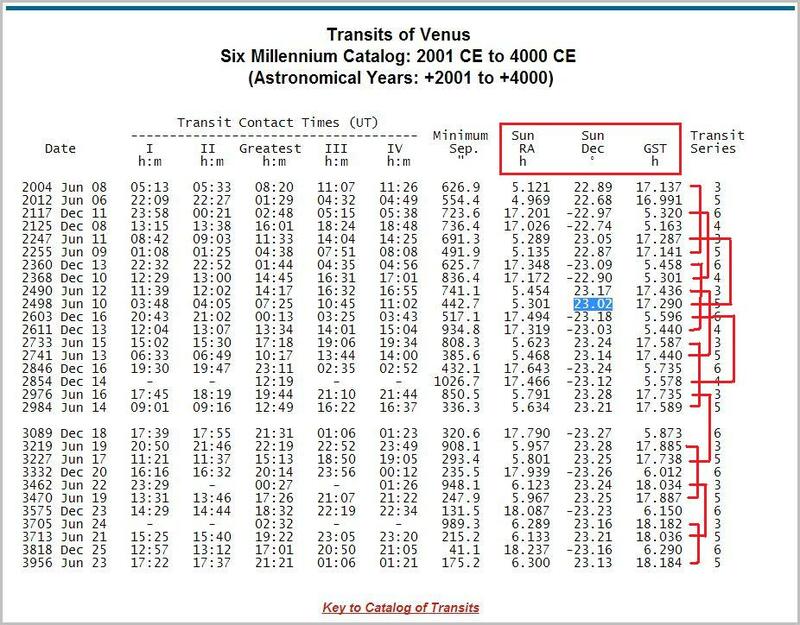 you will see that the separation time between next adjacent representative transit times of Venus versus the year, oscillates around 121.5 years, between the years -100 B.C. and 3000 A.D. Hence, the years in which the ascending or descending node of Venus’s orbit crosses the Sun’s equator are following a long term pattern that repeats every 121.5 +/- 8 years. This is the reason why the 243 year (=121.5 x 2 years) is most likely the more fundamental period. IW: many thanks for your detailed comments. I should emphasize this isn’t an attempt to ‘do away’ with the 243-year period. What I’m suggesting is the 8-235-8 format gives two 243-year periods, one starting 8 years or 5 synods after the other. Clearly the 251 year period is a closer match. ALL the other figures for 243y vs. 251y give the same result i.e. 251 years is always a very close match and is always closer than the 243 year match. This needs to be explained IMO, which is what this post attempts to do. However I note your comments and will continue to investigate. 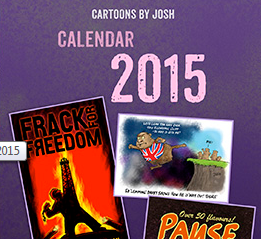 Update: 2 illustrations added, one for 243 years and the other for 251 years. Re: ‘an error of approximately 0.6 days’ – the NASA data shows a much smaller error than 0.6 days (=14.4 hours) for the 243 year period, if I’m reading it correctly as the difference between the GST values? I agree with your July 4, 2015 at 9:21 am post. You appear to have found a 251 year repetition period submerged in a 243 year cycle. It will require a little thought to figure out the physical meaning associated with the 251 year cycle. I would suggest a little caution when you are using the RA/DEC and GST to highlight repetitive alignment. I am sure your are completely aware of the fact that the Equatorial coordinate system of R.A. and DEC is a drifting frame of reference that is precessing with the fixed sidereal reference frame once every 26,000 years (approximately 1 degree of precession every 71.6 years). I added a note to the post at my blog on my latest paper that might give a clue that could help with the investigation. Here is that post. “It is very likely that the lunar orbit partakes in the ~ 26,000 year precession of the Earth’s rotation axis with respect to the stars. When this ~ 26,000 year precession is couple with the ~ 71,000 year wobble of the Earth’s orbit (with respect to the plane of the ecliptic), It produces the well known ~ 41,000 year nodding of the Earth’s obliquity (i.e. tilt of the rotation axis with respect to the plane of the ecliptic). Hence, it is very possible that what I have really found in my paper is that the ~ 26,000 year precession of the Earth’s axis of rotation with respect to the stars is synchronized with the slow drift of the 395:243 year Venus/Earth commensurability pattern with respect to the nodes of Venus’ orbit. Support for this proposal is provided by the fact that it takes ~ 41,000 years for the calender dates for the transit of Venus to cycle once through the seasonal (tropical) year. 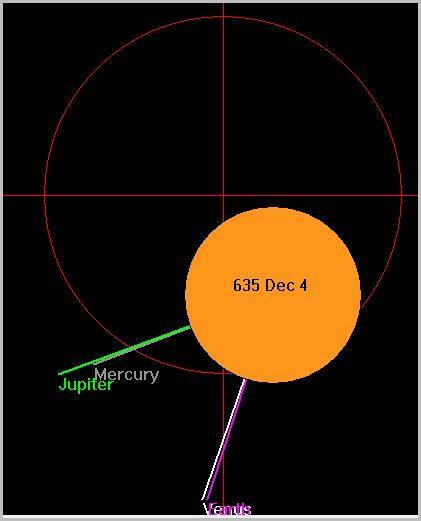 A little off topic but maybe another clue: If you plot the position of Jupiter in its orbit once every 0.79933 years (i.e. every one tenth of 5 VE alignment = 1/2 VE = 7.9933 years), corresponding to the spacing between each consecutive inferior and superior conjunction of Venus and the Earth, you find that the position of Jupiter (with respect to the stars) falls short of (pro-grade) rotational symmetry repetition by almost precisely one degree once every 71.9397 years (i.e. 24.26 degrees for precise rotational symmetry to be achieved compared to 23.29(9) degrees movement by Jupiter once every 71.9397 years). Interestingly, this time period is exactly 9 VE alignments (i.e. 9 VE = 9 x 7.9933 years = 71.9397 years). for an explanation. Pro-grade = clockwise and retro-grade = anti-clockwise. Jupiter is moving in a clockwise direction in this diagram. This is remarkably close to the rate of precession of the Earth’s rotation axis which is 1.0 degree every 71.6 years. I have a feeling that the two are connected in some way but I could be wrong. [Note that the position of the VE alignment which starts at position 0 in this diagram moves 2.412 degrees in a retrograde (anti-clockwise) direction every 10 lots of 1/2 VE = 7.9933 years. This places the point of VE alignment 21.708 degrees in an ant-clockwise direction from position 0 after 71.9397 years. Interestingly 21.708 degrees + 23.299 degrees = 45.007 degrees. In terms of the VEJ model for the Sun this has Jupiter going from a position that produces zero tangential torque on the VE tidal bulge on the Sun’ surface, when Venus, Earth and Jupiter are all aligned (at position 0], to a position that produces maximum tangential torque on the Venus-Earth tidal bulge, when Jupiter is at 45 degrees to the VE alignment]. Interestingly, if you think about the time it takes Jupiter to move 90 degree with respect to the VE tidal bulge on the Sun’s surface = 11.0676 years. which of course are “famous” 575.52 and 1151.03 year periods used in my VEJ paper. ‘This is remarkably close to the rate of precession of the Earth’s rotation axis which is 1.0 degree every 71.6 years. There is an argument floating around that the solar system itself is a moving reference frame. I’m not very good at visualising such things, but if the Earth is precessing at a different rate than Venus, should that be identifiable in the transit data? Conversely if the data didn’t show that, would it tell us anything? It appears that since the 8 year (5 synod) period is known to be in reality slightly less than 8 years, the remaining 243 years (152 synods) of the 251 year period MUST be slightly more than 243 years, in order to ‘balance out’ at 251 years. Therefore any calculation that would result in 152 synods being less than 243 years (on average) can’t be correct? Here’s an edited version of Figure 2 borrowed from Ian Wilson’s PRP paper. What you say is true – but only in a frame of reference that is precessing through 360 degrees with respect to the stars once every 25,800 years. Yes, I suspected that (see ‘Footnote’ to post) – if I understand what you mean. Shouldn’t there be a ‘precession factor’ in the NASA data? If there’s a year’s worth of precession every 25800 years, that’s about 3.55 days in 251 years. That should have an effect on the synodic period (unless Venus is precessing at a similar rate?). 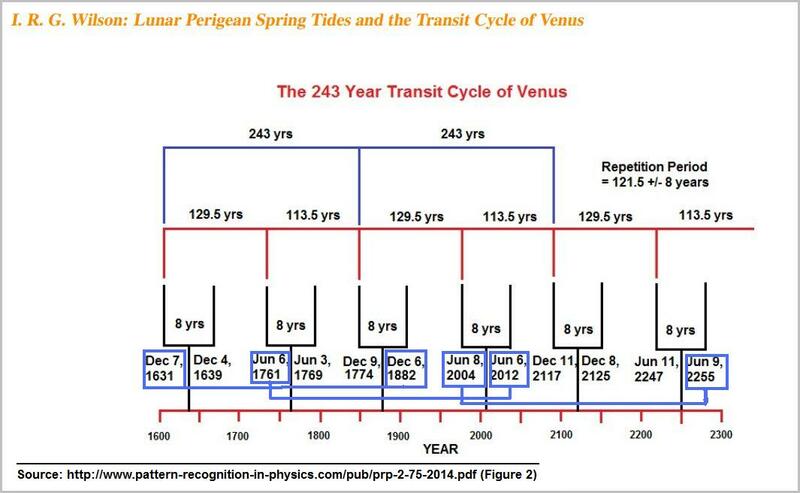 The paper (quoted in the link below) by Dimitris Poulos (I think Tim Channon pointed it out a few months ago) uses a 251-year Earth-Venus cycle. Looking at the data he seems to be using a synodic period value that fits 251 tropical years. NB not sure about 265.4y but there’s a very good match between V-E and J-Me at 251 years. On the solar simulator the conjunctions occur very close together using the December 1639 Venus transit +/- 251 years. Example below: 1004 years (= 251y x 4) prior to 4th December 1639 Venus transit (purple=Earth). There should be 1021 Jupiter-Mercury synods every 251 years. Five Venus days = 583.75 days, which is only a fraction less than 1 Venus-Earth conjunction. Working through the data for 157 V-E conjunctions shows there would be one ‘extra’ LOD period per 4 x 157 V-E.
Those figures are based on the known data. Note that 1632 + 1509 = 3141 so for Venus: sum of orbits + rotations = number of LOD. If the one ‘extra’ LOD is removed the result is 3140 = 157 x 20 (note the 157). Since the period is 251 years, Earth orbits lose 1 (252-1) and conjunctions gain 1 (156+1). Therefore, since the decimal places match (.8733), the physical processes should be in sync. 8,13 and 144 are Fibonacci numbers. What is the adiabatic lapse rate of air?